The race for promotion in Section B of the Ribblesdale Cricket League tightened up again as Padiham edged even closer to leaders Barnoldswick. The aperture between the two has shrunk considerably in recent weeks with Kurt Robinson’s side winning four games in succession. And the latest maximum over Earby at the Arbories now means that Barnoldswick’s advantage at the summit stands at just 12 points. Padiham’s professional Brady Barends was once again the star man as he struck six fours in a knock of 31 in the home side’s 174-9 total. 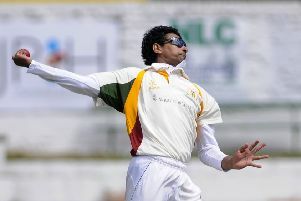 The South African then restricted the visitors with the ball as his six-wicket haul took his tally to 29 for the term. Phil Haggerty found the boundary on eight occasions in making 35 as he shared a 61-run partnership with former skipper Callum Clarke for the opening wicket. Clarke, who scored 18, was the first to go when caught by Nathan Taylforth from Jake Hargreaves’ delivery and that spawned a mini collapse. Captain Robinson and Haggerty both went lbw by Hargreaves and Jason Lockley respectively but Barends, paired with Michael Letson (22), steadied the ship. The lower order struggled for form with the bat but Lewis Meehan was able to boost the total at the tail end in firing an unbeaten 14. Hargreaves was the stand out performer for struggling Earby in taking 6-58 but those efforts were eclipsed by the Arbories paid man. Barends claimed six scalps at the expense of 26 runs from a nine-over spell as the away side fell 117 runs short. Toby Burrows also chipped in with a clinical display that was rewarded with figures of 4-31. Padiham, though, tumbled at the final hurdle in their quest for silverware at the league’s Twenty20 Finals Day. After comfortably seeing off the challenge of Euxton in the first semi-final of the afternoon, they were outclassed by Citheroe in the competition’s finale. Padiham were extinguished for 68 runs before Clitheroe toppled that tally without loss, inflicting their opponent’s first defeat in the competition this season. Elsewhere, Read sunk to a 14-run loss against Whalley at Station Road as the club’s goal of a top four finish hit another stumbling block. Andrew Rushton took 4-49 from a 17 over spell with the ball while professional Ravi Jangid added 2-36 as the hosts finished with 134-7. In the reply, Jangid (30) and Ben Gorton (33) led the chase and George Ashworth contributed with 15 but their efforts weren’t enough.